We had a very successful hatching and raising experience this year as a large percentage of our 1,000 eggs survived to the fry stage. As many of you know the recent flooding threw a curveball into our Willamette River release day plans and ultimately we had to cancel the classroom trip. While it was disappointing to all, our students were good sports as we explained that sometimes nature presents situations out of our control and we have to roll with it. Since we did not have access to any safe site on the Willamette, our biologist at Oregon Department of Fish and Wildlife gave us permission to release our fish in nearby Chehalem Creek. Thanks to the Garstkas for allowing us to park in your driveway and providing safe access to the creek for release. While it was unceremonious in pouring rain today, Mrs. Reed, Mr. Milner, and Mr. Evers made sure the salmon made it safely in their new home. Who knows, maybe in four years a few salmon will make their way back up the Chehalem! Our little red eggs have now grown to the fry stage, and they are eagerly anticipating release day next week. They are also quite grateful that release day was not this week during all the extreme flooding. Our salmon are entering the fry stage and are practicing their swimming skills. They are getting their fins in shape for release in the Willamette River in the next few weeks. Take a look at their progress in this video clip! Our alevin friends have grown a bit since the last video clip. All along, we have been learning about salmon survival rates, external features, and life cycles. Students have started research about salmon species will be writing reports after Thanksgiving break. In December we have some exciting plans regarding learning about stream surveys and stream engineering as well as releasing our finned friends. What’s the foam at the top of the tank? Relax… fortunately it is not soap bubbles. 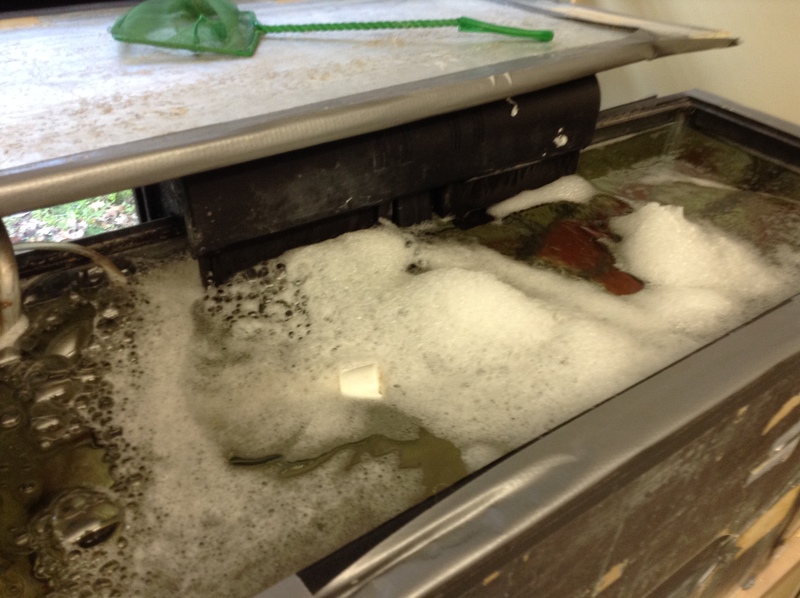 When salmon or trout eggs hatch, some of the contents of the eggs create a hatching foam at the top of the tank. It’s not harmful and can be scooped out. All of our eggs have hatched in both of our incubators. Our students have noticed that the alevins behave differently between both incubators as one has more gravel spread out than the other. Some salmon eggs in both of our classroom incubators are beginning to hatch. Take a look at a few of our new alevins! Here is a clip showing our salmon eggs. They’re in the eyed stage. Still waiting for them to hatch!